Elements Applied: Each plant’s part except the root can be applied in herbal medicine. Active Components: Isoquinoline alkaloids, like sinactine, bulbocapnine, sanguinarine, protopine, canadine, N-methylhydrastine, coptisine, fumaritine, corydaline, fumariline, dicentrine, fumaricine, cryptopine. Used For: The herb is known to induce urination, treat constipation, boost metabolic rates, and relieve liver conditions. 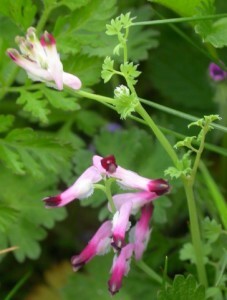 Fumitory has a long history of application for skin conditions, like acne and eczema. This capacity potentially originates from overall purifying effect the plant takes, stimulating liver and kidneys. Fumitory is also applied in form of eyewash to relieve conjunctivitis. Commonly mixed with: Fumitory is commonly used together with Figwort, Cleavers, and Burdock. Additional Info: The herb is indigenous to the British Isles and Europe, and is particularly found in artificially raised fields. Preparation and Intake: To prepare an infusion, take 1-2 teaspoons of dry herb extract for 250 ml of boiling water, and steep for ten to fifteen minutes. The mixture can be taken if necessary, but to relieve skin conditions, the minimal intake is thrice per day. In form of tincture the herb is taken at a dose of 1-2 ml thrice per day. Safety: There is no data concerning the herb’s safety level. It is possible that the plant interacts with the medicine you use. Speak to your health care provider before using the remedy.